As we reach the middle of fall, the novelty of pumpkin is wearing off and our minds are drifting towards wintery treats. But before we get ahead of ourselves, let’s look at three of fall’s biggest superfoods — how they can improve your health and how you can incorporate them into your diet! Pomegranates are in season from September through February. The fruit plays an important role in Ayurvedic medicine; the juice and arils improve digestion and regulate the production of stomach acid. 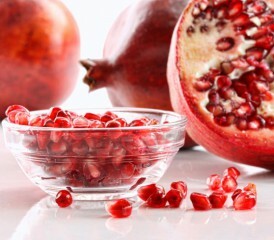 Pomegranates can also help fight cancer. Studies found that pomegranate can suppress inflammatory cell signaling, and researchers at the University of Wisconsin’s Cancer Center found that pomegranate juice helped slow lung cancer growth in lab mice. Cutting a pomegranate is a complicated process. Instead, I like to purchase ready-made packages of the seeds. No mess, no clean-up, just ready-to-eat juicy pomegranate seeds! You can eat the arils on yogurt or oatmeal, but they’re also a fun addition to salads. My favorite recipe is to the left! Swiss chard is in season from late spring to early winter; in the middle of November, most farmers are collecting their fall Swiss chard harvest. Its colorful stems get their pigment from a massive collection of antioxidants that can boost your immune system and promote anticancer activity! Swiss chard contains 13 different polyphenols, or powerful antioxidants. The leafy green is especially rich in quercetin and kaempferol. Both of these antioxidants have anti-inflammatory properties and help suppress activity in malignant cells. One cup of cooked Swiss chard also has more than 700 percent of the daily recommendation for vitamin K. A high vitamin K intake is linked to lower cancer risks; the vitamin can also induce cell death in lung cancer tumors. Vitamin K is fat soluble — meaning the body needs fat to absorb it — so be sure to cook your chard with olive oil, coconut butter or another fat for maximum benefits! Quick rule for the kitchen: You can use Swiss chard anywhere you’d use spinach. It’s great steamed with olive oil and herbs, folded into omelettes or stirred into soups. I’ve always been crazy for creamed spinach, though, and the recipe below is a great option for patients who need to increase their calorie intake! Fennel can be harvested year-round, but most farmers plant it to come in season in late autumn. The herb is used in many traditional herbal medicines. It is best known as an anti-inflammatory food, but it also serves as a natural diuretic. Mesothelioma patients may also benefit from its ability to sooth irritated respiratory and digestive passages. Fennel contains large quantities of the compound known as anethole. (Anise and camphor also have high concentrations of anethole). This compound is a powerful anti-inflammatory agent. An article from the journal Oncogene also explained that anethole can suppress cellular responses associated with carcinogenesis (the process of healthy cells becoming cancerous). Try fennel in salads, alongside vegetables or in this tasty rice pilaf recipe below! Do you make an effort to cook with seasonal produce? What’s your favorite fall harvest fruit or vegetable? Let us know in the comments below or on Facebook.